OLYMPIA – Spokane and the rest of Eastern Washington finds itself in an enviably strong position as legislators return to the capital Monday for the 2019 session. 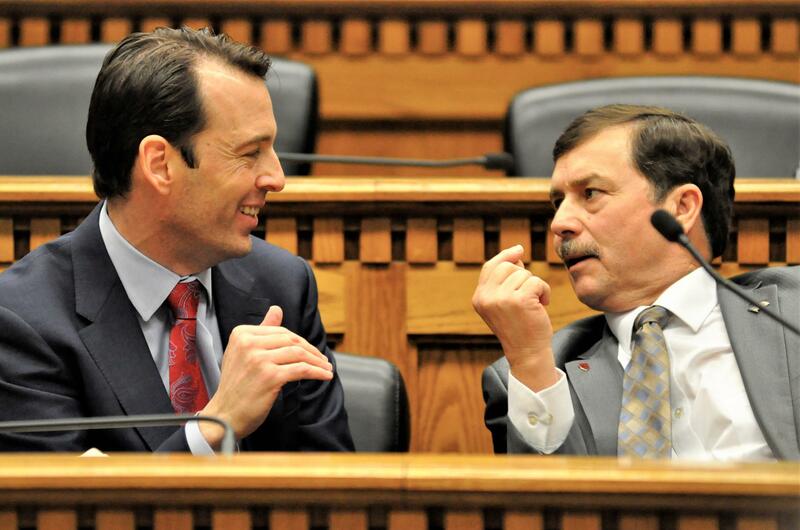 The top person in the Senate, Majority Leader Andy Billig, represents the Spokane city core. The top Republican in the Senate, Minority Leader Mark Schoesler, represents a district that includes the southern third of Spokane County and stretches across the Palouse to Ritzville. It’s a rare but not unprecedented alignment of leadership with Spokane constituents heading both parties in the Senate. Republican Sen. Jim West was majority leader in 2003 when Democratic Sen. Lisa Brown was minority leader. “The Spokane area always has been very well-represented, and our community has always been very active in making its voice heard in Olympia,” Billig said recently. Greater Spokane Inc. brings a delegation of 100 or more local government, education and business leaders to Olympia each January to pitch a wide range of local projects and priorities. It is the largest local lobbying effort in the state. “Of course it helps” having the leadership of both parties, Billig said. It might help most when it comes to finding money for capital projects in Eastern Washington, Schoesler said. There are no big “asks” as in some past years, such as when Washington State University and the Spokane community put on a full-court press for a new medical school. “The delegation works quite well together on those things,” said Schoesler, who was majority leader when Republicans controlled the Senate. Billig, a Spokane businessman who is part owner of the Spokane Indians baseball team, and Schoesler, a wheat farmer, are far apart politically but agree in principle at least on what some of the biggest issues are for the Legislature to tackle: improved mental health services, expanded special education for schools, reducing homelessness and a cleaner environment. They don’t agree how to solve those issues. Their largest area of disagreement in 2019 may be on tax issues, particularly if Senate Democrats support Gov. Jay Inslee’s call for a capital gains tax. Republicans will oppose it. In the past, Democratic lawmakers have suggested a capital gains tax as a way to pay for the growth in state services, but it has never come to a final floor vote. With bigger majorities in both chambers this year, and a new crop of progressive Democrats elected last fall, Inslee’s plan to tax large investment gains on more than $50,000 per year for a couple, or something like it, could make it to the floor for a full debate and vote. Schoesler doesn’t hesitate to turn thumbs down: “It’s an income tax, period.” That’s a point that will be debated hotly if the Legislature considers Inslee’s proposal, because Democratic supporters contend a capital gains tax is actually an excise tax, similar to a sales tax, rather than an income tax, which is restricted by the state constitution. Republicans and conservative groups agree with Schoesler. If Democrats want a capital gains tax, they should first get the Legislature and the public to approve a constitutional amendment that limits it to proposed levels to prevent future lawmakers from expanding it, Schoesler said. In many respects, the concerns of Spokane and Eastern Washington are no different from Seattle and the rest of the state, Billig and Schoesler said in separate interviews. The Legislature will have to make improvements at Eastern State Hospital in Medical Lake as well as Western State Hospital in Lakewood. Both are aging and need extensive upgrades and the costs must be balanced against the need for cities, towns and rural counties all over the state that are without the mental health professionals their communities need. Many school districts are struggling with the changes to the state and local property tax levy system lawmakers passed over the past two years to satisfy a Washington state Supreme Court decision demanding better funding for schools. Homelessness affects rural and small town communities just as it does the Puget Sound’s urban core. The strength of the delegation of legislators with districts wholly or partly in Spokane County extends into the House, where Rep. Timm Ormsby, like Billig who represents Spokane’s urban core, is chairman of the House Appropriations Committee which will take the lead on writing the 2019-21 operating budget. WSU Spokane is asking for money to expand the next class to enter the Elson S. Floyd College of Medicine to 80 students, from its current 60. If that’s in line with past policy decisions to eventually make the incoming medical school classes at WSU and the University of Washington partnership with Gonzaga equal, “we’ll continue to do that,” Ormsby said. He agreed many of the issues the Legislature will address this year are common to both sides of the state, and to urban, suburban and rural communities. Legislators get lobbied to make sure their district “gets their fair share,” but have an obligation to make sure residents of the state, as much as possible, have equal access to services. Rep. Joel Kretz of Wauconda is the Republicans’ deputy minority leader. Kretz lives on a ranch outside the town, but his 7th Legislative District, which borders Canada all the way to Idaho, actually has about a fourth of its voters in the north Spokane suburbs. Rep. Marcus Riccelli, the other House member who represents central Spokane, is the Democrats’ majority whip, a leadership position that makes him responsible for knowing where the votes are when key legislation comes up. Because Billig, Riccelli and Ormsby are the only Democrats from Eastern Washington, and that party controls both chambers and thus the committee chairmen, some Spokane-area Republicans are assigned as “ranking” members on a series of committees. Among them are Mike Padden, of Spokane Valley, who serves as the top Republican on the Senate Law and Justice Committee, Jeff Holy, of Cheney, top Republican on Senate Higher Education, and Shelly Short, of Addy, top Republican on Local Government. In the House, Matt Shea, also from Spokane Valley, is the top Republican on Environment and Energy, and Joe Schmick, of Colfax, is the top Republican on Health Care and Wellness. Ranking minority members don’t get to set agendas or run meetings, but they do keep track of where their members stand on contested legislation and can be in a bargaining position if Democrats don’t have the votes to get a bill out of committee by themselves. They can also be their party’s leading voice for debate when a bill comes to the floor for a vote of the full chamber.